Henry James made these remarks in 1897, in his 'Old Suffolk' (later anthologized as part of English Hours). The fate of Dunwich fascinated the Victorian mind. The town had come to public notice in the 1830s as one of the 'rotten boroughs' eliminated by the Reform Act of 1832 - until the Act was passed, Dunwich, which then had a population of less than forty, still had the right to elect two MPs. 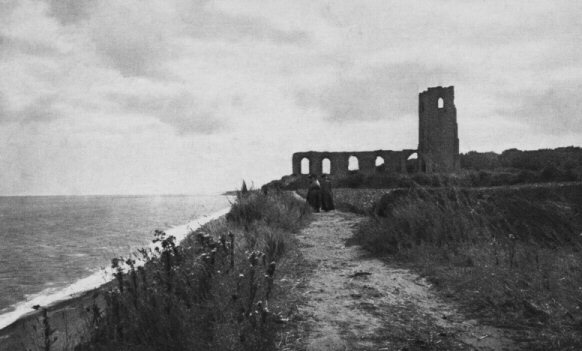 Its notoriety led to a reawakening of interest of the ‘visibly mutilated’ town, and poets and painters - most, no doubt, taking advantage of the East Suffolk Railway, opened in 1851, - rushed to Dunwich to indulge in melancholy disquisitions on the vanity of physical existence. After all, the disappeared port was practically a vanitas painting brought to life - or to unlife; for, if as James notes, all the town's 'positive life' had crumbled away, what is left at Dunwich must be either a negative life or a negation of life. There is rather more in James' observations than the penny dreadful piety and mawkishness which Dunwich brought out in many of its Victorians observers. James understood that, for the mind capable of brooding - and he insists, later in the essay, 'that it to the brooding mind only, and from it, that I speak' - there is a jouissance to be derived from the melancholy contemplation of what has disappeared, and continues to disappear. There were major landmarks yet to disintegrate when James visited in 1897. He would have still been able to see All Saints Church - shown above in a photograph from 1904 - but by 1920, it, too, would be 'at the bottom of the German Ocean'. Twenty years ago, 'the bones of those buried in All Saints' graveyard protruded gruesomely from the cliff, and a single gravestone, to John Brinkley Easey, stood in an inconceivably bleak loneliness at the cliff top.' Now even those traces are long gone. Slow change is a constant at Dunwich. When I visited last week it had changed even in the comparatively short time since I was last there. Paths that were once walkable are now fenced off as unsafe. Walking around the remains of Dunwich - and Dunwich is nothing but remains - is not, then, only to contemplate a past disaster. Even without global warming to accelerate the process, visitors can be certain that the land on which they walk will soon be consumed by the sea. The destruction of the great port 'with a fleet of its own on the North Sea' was dramatic and sudden, but if the erosion which still gnaws away at the coast around Dunwich is more gradual, it is also implacable. Global warming means that oceanic catastrophism confronts us now neither as a possibility that can be quarantined off in Science Fiction, nor one that is unthinkably distant. It was fitting that James should have devoted most of his ‘Old Suffolk’ to writing about Dunwich. Disappeared Dunwich, its churches and cathedrals now lying on the ocean floor, anticipates the near future of the whole county. Suffolk has always been fighting two wars - the war against the sea, which will be lost, the groynes and the granite on the beaches providing makeshift coastal defences that will only retard the process of erosion, not end it; and also the war against invading foreign armies. Virtual wars have long shaped the county: the overgrown pill boxes, tank traps and deserted Cold War bases which make so much of the county resemble Tarkovsky's Zone are relics of conflicts that never occurred. 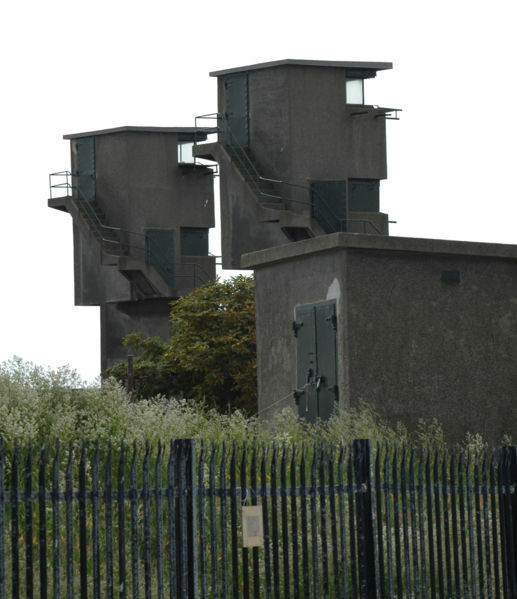 The Martello towers which stud the coast stand waiting for a Napoleonic invasion that would not arrive, their squat and bullish defiance sufficient in itself to dissuade the French forces from attacking. A little up the coast from Landguard, you come to Bawdsey. It was here that radar was developed, a massively undersung moment both in the Second World War and in the (feminist) history of cyberspace. Bletchley Park's role in cracking the Enigma code has been endlessly celebrated, in films, documentaries and novels, while Bawdsey has remained obscure. Yet its role in winning the Battle of Britain was decisive: radar - operated in the main by women - enabled an outnumbered RAF to overcome the Luftwaffe. The transmitter block at Bawdsey, open to the public throughout the summer, is a short walk from Bawdsey Quay, whose lights M R James described seeing from across the Deben Estuary in 'O, Whistle and I'll Come to You, My Lad'. Then there is Rendlesham forest, site of one of the most famous UFO incidents in Britain in 1980. Bentwater airbase, one of several Suffolk airfields abandoned by the USAF in the early 90s, is on the edge of Rendlesham. it was here that, last weekend, the second Faster than Sound event took place. Suffused by the gradually dying June sunlight, the site was fabulously evocative - a Ballardian space in which wildlife scampers amid the decommissioned furniture of the Cold War: disused control towers, hangars, mysterious and ominous and concrete bunkers, delicious in their brutalist functionalism. These Suffolk airfields are haunted by the terrible spectres of missions that, thankfully, did not occur, terminal commands that were never issued. Hildur Guðnadóttir: first to perform in the 'Multi-National Circle', an outdoor concrete circle adjacent to a runway, Hildur overcame the unceremonious conditions in which she was asked to play (she wasn't introduced, and the late afternoon sunlight threatened to dissipate any atmosphere) with a performance of sombre rapture, her cello multiple tracked (with live playing augmented by laptop loops) into a slow sonic ocean sound whose ebbs and flows were shifted expertly around the six speakers of the ultravivid PA by BJNilsen. Hildur achieved something akin to the dark tranquility about which Dominic writes so eloquently, the suspension of all urgencies in a viscously tactile sound that gives the illusion of being poised on the edge of stasis (perhaps it's no accident that Xasthur use cello). Pierre Bastien - with its menagerie of mechanical machines beavering away to produce triggering samples, Bastien's enchanting Meccano-musique plastique, brilliantly described by Pete Smiley on the Fact website as 'rusted and tragic and astoundingly beautiful, like early Tom Waits mixed with ancient ragtime', is what you imagine Jan Svankmajer would make if he was a sound artist rather than a film-maker. It's music from an alternative nineteenth century, steampunk hip-hop. 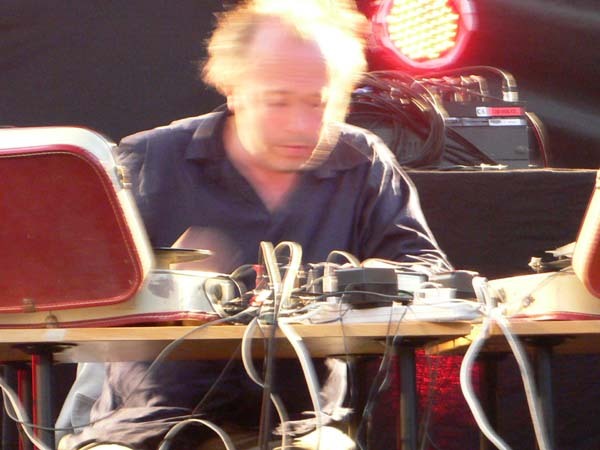 Philip Jeck - a godfather of sonic hauntology, of whose work I was shamefully ignorant until last weekend. Using two turntables and a magic-box of effects which defamiliarise the vinyl source material to the point of near-abstraction, Philip reconceives DJing as the art of producing sonic phantasmagoria. The occasional recognizable fragment (the Byrds, Mantovani-like lite classical kitsch, sonic objet as made all the more alluring by their partial submersion) thrillingly bobs up out of the whooshing delirium-stream. As he performs, Philip leans over his machines with a look of tender melancholy (perfectly captured in Jon Wozencroft's picture, above), almost as if he is tending a dying puppy. Colleen. Colleen struggles. Sadly, the PA isn't turned up loud enough to compete with drunken boors, chatting bores and banging tunes coming from elsewhere on the site. She plays tracks from her new record, memorably described by Clare O'Brien as resembling either 'music played by aliens for a courtly masque staged on another planet or a talented child let loose into a music shop.' Colleen's delicate lite-baroque sound, produced by viola da gamba, acoustic guitar, clarinet, wind chimes and music boxes, and given an uncanny edge by unlive loops, is oversweet, excessively pretty, yet winningly so. 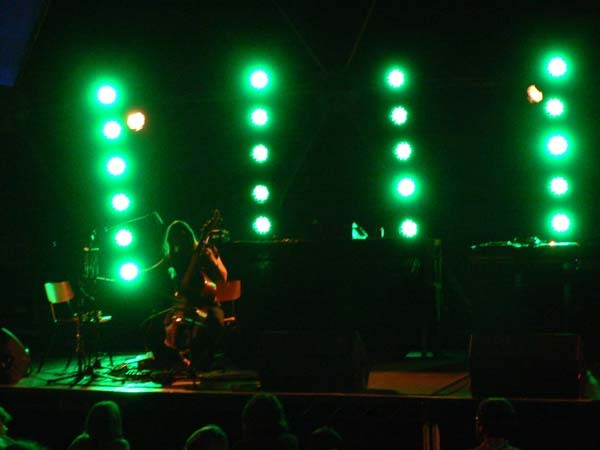 'Like a female Durutti Column', says Jon Wozencroft. By now the Suffolk night has descended, and, as we leave, the poorly lit airfield is doubly eerie. Individual performances made Faster than Sound 2007 memorable, but the overall effect was too disparate, and I am left musing about the possibility of an unlive hauntology event that could make much better use of the semi-deserted spaces of Suffolk, an event that would be like some combination of film set, fiction and installation, in which each element forms part of kit, assembled differently by each person who attends. Is such a thing inconceivable?